An unaltered photocopy of your DD-214 displaying your Ceremonial Service duty. If your Ceremonial Service is not listed on your DD-214 you must provide additional military-issued documentation authorizing/confirming your Ceremonial Service. Establishment of the Navy Ceremonial Guard Ribbon was approved by Secretary of the Navy Gordon R. England on December 12, 2003. The Navy Ceremonial Guard ribbon is effective retroactively to May 1, 2001, the date of the formal establishment of the Navy Ceremonial Guard. The Commanding Officer, U.S. Navy Ceremonial Guard, is designated as the awarding authority for this ribbon. This ribbon is awarded to militatry personnel assigned to the Ceremonial Guard, Washington, D.C., on May 1, 2001 or later and who have completed a successful tour of at least two years or who who have completed a minimum of eighteen months (consecutive or non-consecutive) in a drilling status. "Drilling status" is defined as actual participation in ceremonies and funerals as casket bearers, firing party, color guard, ceremonial drill team, and marching platoons (to include commanders of troops, platoon petty officers, and POICS). A "successful tour of duty" is defined as service in a drilling status for a minimum of eighteen months and completion of standard honors qualification or higher. The eighteen-month minimum requirement is waiverable by the awarding authority only for those personnel receiving full honors qualification. A successful tour of duty also includes maintaining outstanding personal standards without disciplinary incidents (no non-judicial punishment, indebtedness issues, failure to meet PRT standards or other actions bringing discredit upon the ceremonial guard and the Navy). The Ceremonial Service Ribbon will be worn after the Navy Recruit Training Service Ribbon and before the Armed Forces Reserve Medal. Second and subsequent awards will be denoted by three-inch bronze stars. Only one award per tour will be authorized, regardless of the length of the tour. No citation or certificate will be issued. The Navy Ceremonial Guard Ribbon is presented to those members of the Navy who, while stationed in Washington D.C., complete a standard tour of duty with the Navy Ceremonial Guard. A standard tour is defined as at least two years of duty with no disciplinary action, above average evaluations, and adherence to physical and military bearing standards of the Navy Ceremonial Guard. Also must be in a "fallout" status for 18 months, and reach at least Standard Honors within a platoon ( firing party, casket bearers, colors or drill team). The Navy Ceremonial Guard Ribbon is also awarded to members of the Naval Reserve who complete at least 18 months of successful drills as members of the Navy Ceremonial Guard. The term "successful drill" is defined as actual participation in ceremonies and funerals as casket bearers, firing party, color guard, ceremonial drill team, or as members of marching platoons. 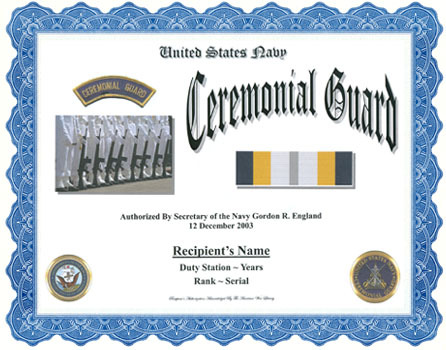 Reserve members of the Navy Ceremonial Guard are also bound by the same physical and military requirements as the active duty members and must maintain a discipline free record for the Navy Ceremonial Guard Ribbon to be awarded. The ultimate award authority for the Navy Ceremonial Guard ribbon is the Commanding Officer, United States Navy Ceremonial Guard, headquartered in the Washington Navy Yard. 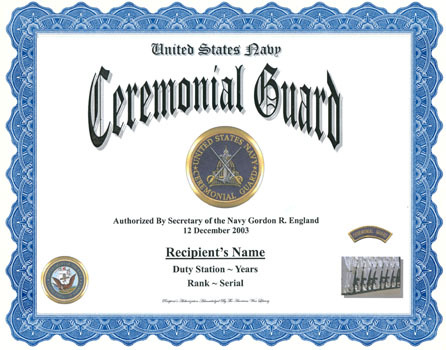 Multiple awards of the Navy Ceremonial Guard Ribbon are denoted by bronze service stars, however only one award of the ribbon is authorized for each tour of duty.